A TVC is not a specific micro-organism but rather a test which estimates total numbers of viable (for the purposes of this data sheet viable means living) individual micro-organisms present in a set volume of sample. The TVC count may include bacteria, yeasts and mould species. 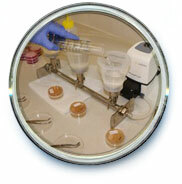 There are different test parameters for different types of samples. For example, for drinking water samples Yeast Extract Agar is used by the laboratory and incubation temperatures of 37 and also 22 deg C are used to grow the micro-organisms. For cooling tower waters a single temperature of incubation is used of 30 deg C. For food samples a different medium is used which is slightly different to Yeast Extract Agar. Clearly it is impossible to have a set of conditions that are ideal for all organisms likely to be present in any one sample. This should be borne in mind when interpreting the results. TVC results are however very useful for trend analysis whereby changes in the numbers of microbes present in a system can be monitored over time and multiple samples. This can reveal useful information regarding factors having an effect on TVC counts, eg If a count is substantially higher during summer months it is likely that the organisms in the system are fluorishing in higher temperatures and a suitable control measure may include reducing the temperature of the system in the summer. A TVC test is only an estimation and results should be considered as an order of magnitude, e.g. less than 10, less than 100, less than 1000. A count of 50 cfu/ml obtained one month followed by a count of 60 cfu/ml would not be considered as significant based on the limitations of the procedure however a count of 50 one month followed by a count of 6000 the following month is clearly indicating a dramatic change to the system. If you are an existing client and would like further technical data on this test please contact the lab for instructions on how to access and a passcode which is required to obtain this information.